TOMOS means TOvarna MOtornih koles Sezana (motorbike factory in Sezana, Slovenia). Warranty is 6 month/4000 mile limited. Owner must send in the warranty registration card located in the owner’s manual to activate the warranty on a brand new Tomos. Engine is the A55 two-cycle 49cc single, EPA and CARB compliant with catalytic exhaust. Speed is 30mph. Horsepower is 2hp. Transmission is two-speed fully automatic. Pedals go forward for hybrid human/motor propulsion. Pedaling speed is 5 to 10 mph. Pedals kick backward for starting engine. Pedal forward to put pedals in kick position. Gasoline is 90 octane minimum. Only Sprint model is pre-mixed with oil 50:1 or 2.5 ounces per gallon. All other models have oil injection and use straight gasoline. Gas tank size: LX 1.5gal Sprint, ST 1gal. Arrow, Revival, Streetmate .75gal. On the LX and ST locking gas lid, only the key turns, counterclockwise to open. On ’05-08 Arrow, Revival, Streetmate the gas lid is push in. It pulls straight out. Sometimes it’s tight. After 2008 all gas lids are quarter-turn type. Gas valve is a manual fuel tap or shut off. It is located above the engine on the left side of the bike. It has three positions, off (horizontal), on (down), up (reserve). Use on during normal operation. Use off when not operating. Use reserve if you “run out of gas”. Reserve lasts 4 to 10 miles. Don’t forget to put it back to “on” after you gas up. Gas level is checked by opening the gas lid, looking, shaking, and listening. There is no gas gauge. On the LX you can see the whole tank. On the ST and Sprint you can see half way. On the others you can only see the first fourth. Many people choose to install a clear hose branching up from the fuel line. It serves as a gas gauge. The liquid level in the tube is the level in the tank. Gas tank vent: On Arrow/Revival/Streetmate models the gas tank is inside the frame, which is U-shaped. On one end of the “U” is the fill hole, where you add gas. On the other end of the “U” is a vent to let air in and out. It normally lets a tiny amount of air pass but not enough during refueling. When adding gas, the gas tank vent, a black spring-loaded push button, needs to be pushed each time the tank seems full to let any air escape allowing more room for gasoline. It makes a hiss sound. When the ¾ gallon tank seems full and the vent no longer hisses then it’s truly full. Gas mileage (mpg) is 100 miles per gallon, going 37mph on city streets. If you’re larger, have hills, rough roads, stop and go, your mpg (and range) will be less. If you’re smaller, more aerodynamic, and go slow, your mpg (and range) will be more. Gas range: LX 125mi Sprint, ST 85mi Arrow, Revival, Streetmate 60mi. Means topped off to hitting reserve, 160lb rider on smooth flat city streets. Oil is two-cycle oil. It’s slowly consumed by burning along with the gasoline. Use a good brand, preferably synthetic, like Champion weed wacker oil. Without the oil the two-cycle engine will get hot, melt the sides of the piston, and “seize”, with a scary skid. Oil tank is under the seat, except Sprint, which is premixed in the gas. It doesn’t matter how much oil is in it, only that there always is some. Check the oil level at each gas fill-up. After several gas fill-ups it will need an oil fill-up. 13 ounces lasts about 5 gallons. Steering lock is on the left front of the frame. To lock, put the steering almost all the way to the right, push the key in while turning it to the right. Move the steering slightly until it finds the hole and goes down 3/8 inch. To unlock, turn the key to the left, pull up, and wiggle the steering if necessary. Keys: Sprint = steering lock only (2), no ignition key. No battery to turn off. Keys: ST/LX = steering lock (2) and gas lid (2), no ignition key. No battery to turn off. Keys: Arrow = steering lock and ignition (2). Turn off ignition and battery after use. Keys: Revival = steering lock, seat, and ignition (2). Turn off ign & battery after use. Keys: Streetmate = steering lock, seat, trunk, ignition (2). Turn off ign & bat after use. 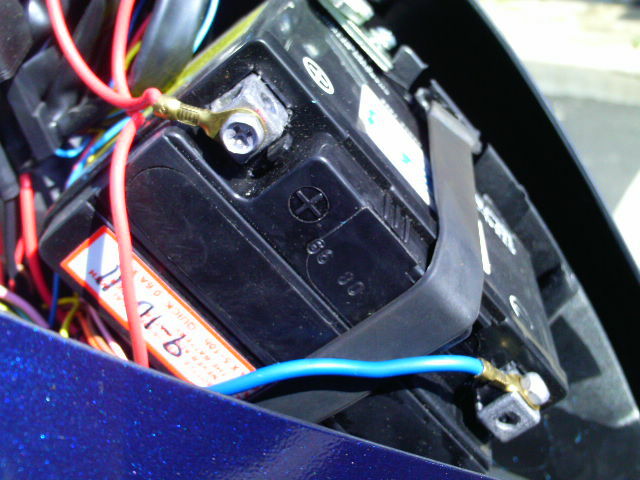 Main key switch, also known as “the ignition”, on Revival is on left top of the fake gas tank. On Arrow and Streetmate it’s under the left side of the seat. Choke is manual. It’s needs to be on (flipped up) for starting when the engine is cold. After a few seconds, when the engine is warmed up, it needs to be off (flipped down). In winter, temp 40 F, the choke is left on for the first two blocks. For normal temp 70 F, the choke is left on for 10 seconds. In hot summer, temp 100 F, it’s not needed at all. Never leave it idling for long periods with the choke on or it will become “flooded”. Never use the choke when the engine is warm or it will become “flooded”. It’s better to under use the choke, than to over use it. If the engine becomes flooded, then it will need no choke and full throttle (maximum air) to compensate for the excess fuel that has accumulated. Running fast cleans it out, and is better for a two-stroke than idling. Starting: Turn engine stop switch to “run” symbol. It’s on the right handlebar. Starting: Revival/Arrow/Streetmate only. Put the key in and turn it on. Starting: Cold starting only. Put the choke on by flipping the black lever up. Starting: Stand on the ground with the bike on its center stand. Pedal forward until the pedal on your side is in the 2 o’clock position. Have your left hand fingers on the left (rear) hand brake, ready to stop in case it comes off the stand and takes off. Have your right hand on the throttle, with the twist grip turned only just a little, or not at all. Now kick backwards. A broke-in new Tomos starts in one kick. Starting: After it starts, rev it up by twisting the throttle. The engine needs to be revved up either stationary on the center stand or moving down the street. Starting it up and then letting it idle to warm up is not necessary or recommended. Its two-stroke crankcase already has the oil film, so it’s ready to ride immediately after starting. Starting can also be done with the tires on the ground, off the center stand. Pedal the bike forward, maybe 10 or 20 inches, to put one of the pedals in kick position. Starting can be done while moving. Just stop pedaling and kick backwards. Electric starting is on Arrow/Revival/Streetmate only. Use the above starting steps, but replace “kick backwards” with “hold the left brake and push the start button”. The start button is where your right thumb is. Then ride for 10 minutes to recharge the battery. Storage: Ride it with the gas valve turned off, to evacuate the gas from the carburetor. After about a block when it runs out, put the choke on and it will go another block. Doing this will prevent the carburetor from getting coated on the inside with tar from dried up gasoline during storage. Flooded Starting: Occasionally the moped can become “flooded”, a condition where too much gasoline and not enough air is causing the engine to not start. When this occurs, a different starting procedure must be used. First the gas valve should be turned off. The carburetor holds enough gas to run for at least a minute. Instead of minimum throttle with choke on (up), it needs maximum throttle with choke off (down), to get the most air. Once it fires, it needs the maximum throttle for awhile, maybe 5 or 20 seconds, until the rough running goes away. Then it needs 15-20 minutes of fast running to heat up the exhaust fully, to boil off any unburned gas and oil. During this period it will smoke a lot. If it does not fire within a few full kicks, then the spark plug will need to be removed and the gas or oil dried off it. If the white or brown porcelain insulator is shiny or black, then it will need a new spark plug, NGK BR7ES. Here are the causes of “flooding”. Knowing these before it happens will help prevent the problem. When a moped is leaned way over, especially with the gas left on, such as when it is being transported, gasoline can spill into the air filter or into the intake port of the engine, and result in not starting. This also can happen on Revival and Streetmate when gasoline spills over during filling. When the engine is run with the choke on too long, the spark plug can get wet with too much gasoline, and result in the engine not starting. Idling for too long, or going slow all the time can also cause this. When the engine is kicked over many times without having a spark, such as when the kill switch is left in the off position, the spark plug can get wet with gas and result in not starting. If the float valve inside the carburetor malfunctions, gasoline can spill into the air filter. A tiny fiber can cause that, or tar from a long time sitting, or a worn needle valve and/or seat. If the oil injector leaks oil into the engine during storage, then the spark plug can get wet with oil. Remove the spark plug, kick over the engine to push out any excess oil, and clean the oil off the plug. Left, two views of the Revival battery. It’s a common size used on most modern 49cc bikes with electric start. It’s a 12 volt 4 amp-hour, gel cell sealed type, BTX4L-BS or compatible. 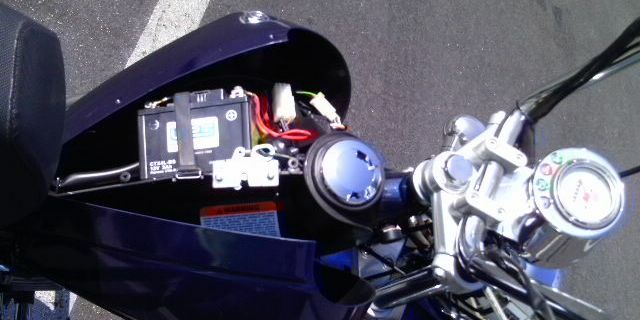 It has to lay sideways and the rear terminal wire has to be like shown, or else the cover won’t close all the way. Even when it is correct the cover has to be pushed tight to make the screw holes line up. You are currently browsing the archives for the Tomos Basics category.